This game looks like it will have its own currency earned by playing or purchasing, and with that currency you will be able to purchase power-ups and possibly parts of outfits. There will also be Spike costumes you can unlock through objectives. 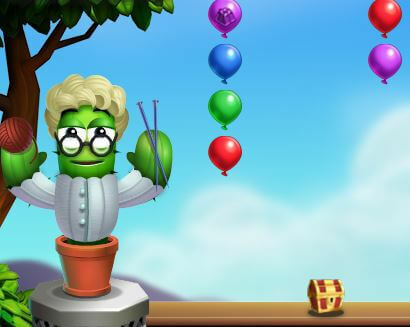 In the objectives, for example, you might be required to release 10 prizes and the reward for that objective might be something like a new outfit for Spike. We can also expect this game to have rank badges as well, probably the typical 10, 20, 30, 40, and 50. All of this is subject to change before release, as usual. 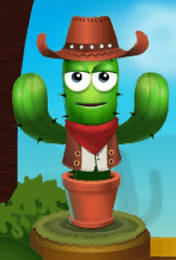 Other costumes include Cop Spike, Disco Spike, Doctor Spike, Fireman Spike, Gardener Spike, Greaser Spike, Hippy Spike, King Spike, Knight Spike, Knitter Spike (shown above), Magician Spike, Nestor Costume Spike, Pirate Spike, Propeller Hat Spike, Robot Spike, Safari Spike, Scuba Spike, Super Hero Spike, Teacher Spike, Tiki Spike, and Tourist Spike. No thanks Pogo. Not too impressed lately. Definitely debating on whether to keep up the membership or not. Would much rather they invest some money in converting more Java games, but know that will never happen because anything new the put out there has to have the ability to generate more money over and above our yearly fees. They have to be raking in a ton of money in badges, mini items, HOG episodes, etc, etc. Sure they may give everybody “sales” and the occasional free M-n-M badge, but still not feeling the love from Pogo like it used to be. I have to agree with you. I stopped paying my yearly subscription a while back and now pay 3 months at a time. Yes, it costs more, but it gives me the freedom to leave when I want to. I’ve found that even though I’ve been retired for almost 3 years and have more time to play, I’m slowly losing interest. Not much is fun anymore and hasn’t been for a while. I’ve given myself a goal and will pay my 3 month renewal in April but probably will shut it down after that. This isn’t new; it’s a retread. And, it’s a retread of one of my least favorite games on Pogo. I will only play this if it’s a challenge. I too agree with the above comments, another game that cost money to play…not feeling the love Pogo. Also not a big fan of Poppit, why don’t they convert some of the java games??? They need to come up with new games, or if they’re insistent on repeating the games they already have, at least remake some of the Java ones. I totally agree William. If they are going to upgrade games, they should be Java games! For the time being, flash is still supported. 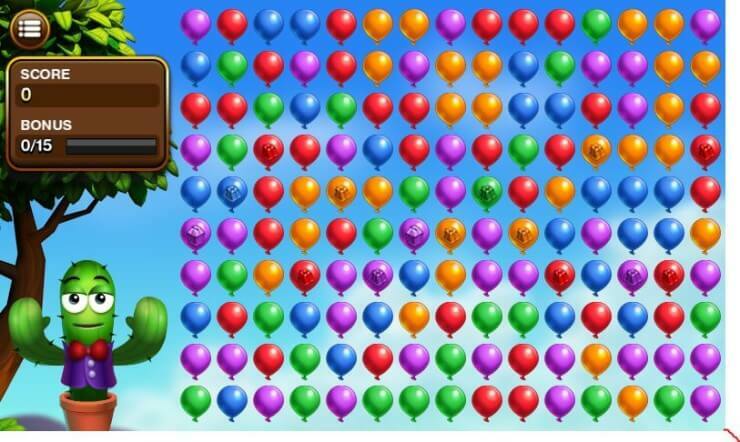 There are so many fun Java games out there that lots of players enjoy playing will soon be lost to us! So sick of Poppit! And the announcement of Phlinx II is just as unwelcome. Currently on tourney’s and these games are so boring. What will it take Pogo to rotate the games in the tourney? New powerups? Abandoned download game The Poppit Show had some game changing items that could be thrown in. This is probably the most underwhelming “new” game so far of the HTML5 batch. Surely there’s more to it than what Pogo previewed. Really tough to get hyped about it when I didn’t care for Poppit as it is. From the photos above, it looks like the prizes are much harder to see. Since I own a tablet that won’t get Java or Flash, I welcome the new HTML5 games. I agree that Java games should be converted to the new format. It makes sense since Pogo spent all that money developing and /or buying those games. But when did Pogo ever make any sense! Also, I guess, because there’s nothing to buy in the old Java games, they aren’t interested (even though a large portion of their ever decreasing membership wants this). As a point of information: Yesterday, when my husband was updating Firefox and we tried to get Java to load, Firefox acknowledged that Java wouldn’t work and said that they were working on restoring it. O gosh talk about underwhelmed. First they decide to add another phlinx as a ‘new game’ and now this. I dislike Poppit, one of my least favourite games. In fact I find it childish and mind numbingly boring. This is not a welcome release and I can’t see me playing it except for a badge, and even then I may pass. Some of their most popular games are Java and so rather than doing something about that they decide to go with games already in flash that aren’t the most popular. I still don’t understand why they stopped converting games to flash. If they insist on bringing out another version of a game at least make it one that’s currently java. I agree with everyone else. Why on earth if they are gonna continue to make new versions of the same old games to HTML 5 why wouldn’t you do it with Java games since it seems like that’s what the majority of your members are constantly asking for? Why would I want to play Poppit on HTML 5 when I can play it on flash? Makes no sense to me. Not interested in this or Phlinx 2 at all. If anyone remembers I actually joked about this last year. I said that one of these days they would revamp Poppit as a means to start charging for power-ups. Sadly, this doesn’t surprise me one bit. I actually anticipated this would happen before we’d see new ranks added to Poppit Sprint. It really makes me sad. Since all they want to do is charge for power-ups, it seems to me that there are plenty of Java games that they could revamp. I’d could give some examples, but I’ll leave it up to their greedy minds to figure it out. Leave it unreleased or close it. I come to Pogo to enjoy games not to figure out tricks with power ups. The game is already released, and a majority of the members love it, so Pogo isn’t going to close it either. And all the work has been done for you, nothing left to figure out. I have been playing Poppit Party since it was released. But, I still cannot use the power up to change a chest to gold. Does anyone know why? I click on the power up and then click on the chest I want to change and nothing happens. You have to use it while the box is still inside the balloon.